It’s a Gibson, so it‘s made in the USA. Access to the top frets is not a strong suit of this guitar. I’ve played many Ibanez axes that have easy access; Les Paul upper fret access is somewhat limited. The tone of the guitar is thick and clear. It has more weight than Ibanez guitars, but not as much as 1970s LPs. I purchased this amp new in the box in 2001. I’ve used a lot of amps with this guitar: Mesa Triaxis, Marshall DSL 1x12, Ampeg VL502 1x12 combo, Ampeg VL502, Marshall TSL100, Mesa Single Rectifier, Orange Tiny Terror….but the current amps are my Randall mts heads: rm100KH, rm50, and rm20. Modules utilized include dozens of professionally modified modules emulating Cobra, Marshall, Rectifier, MesaMark, Orange, JTM, Blackface, Deluxe, XTC, Diezel, 5150, Engl, and many more…. My favorite sounds are the classic Marshall (Aerosmith, G&R) and hi Gain Marshall Zakk Wylde. Other hiGain tones from my Cobra module for rhythms, 5150 for leads, and JTM for cleans. Least favorite tones may be clean acoustic style chord strumming. This axe can do it, but I prefer a Fender Strat for this type of playing. Overall, this Les Paul fits my style perfectly: modern Hard Rock and Metal. 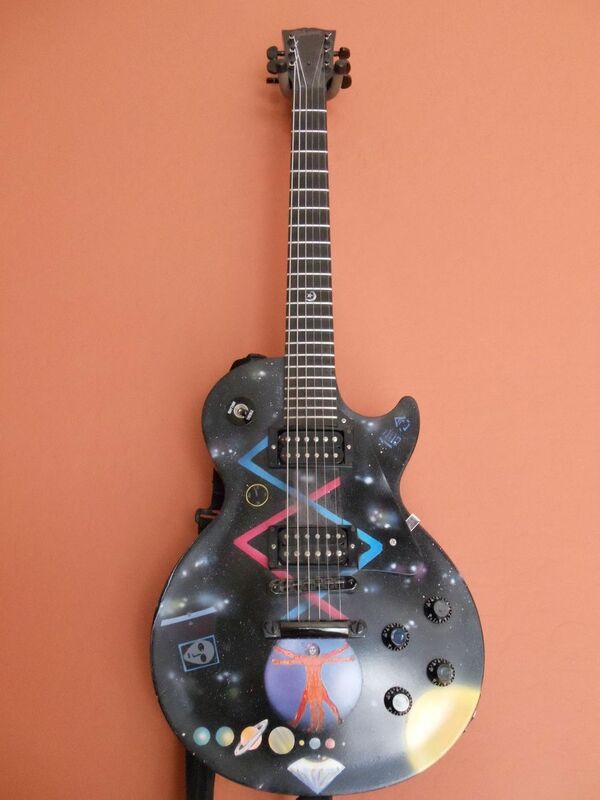 This guitar screams Hard Rock authenticity. I used to be an avid Ibanez fan….until one night at CBGBs, 9-25-01. The other guitar player in my band was an excellent songwriter and a decent player, but had nowhere near the shred skills I enjoyed. We received a recording from that night, and the difference in tone was HUGE- hew wrecked me! He had a Gothic Les Paul; I played my Ibanez Jem. I vowed to improve my tone…..
A few weeks later, I scored my own Gibson Gothic LP. I tried out around 10 of the same model before finding one that “spoke” to me. Just like any guitar company, identical models will sound different. I found my axe. During the next year, I sold off all of my Ibanez guitars and went exclusively with the LP. The original black paint looked decent, but knowing this would be my main guitar for a long time, I had a friend put a custom paint job on it. Intonation. A proper setup can help this, but LPs are notorious for having this issue. Also disappointing are the volume pots; my Ibanez guitars were excellent in this department. This LP may need replacing as it gets scratchy and inconsistent during volume swells from time to time. Upper fret access is not so easy. I thought this would be a problem, but as years go on, I could care less about “only” having 22 frets. I can access the top notes when need be, but it’s not like other shredder guitars. There is one gigantic advantage: TONE. The Gothic LP exudes power and fullness to each and every note. Chords are full and beefy. Once you spend some time playing a decent LP then revert to a different axe, other decent guitars suddenly sound thin and toy-like. The Gibson Les Paul sounds like MONEY; it conjures up tones from my favorite players. If you’re into friendlier rock like Led Zeppelin, Aerosmith, or G&R, there may be better LP choices. But this is the choice if you like tuning down- I go from standard and hit many tunings all the way down to dropA. This guitar is more ferocious, more angry than other Pauls I’ve played. As a point of reference, I have owned a Les Paul Custom and had a 1970s LP in my possession. 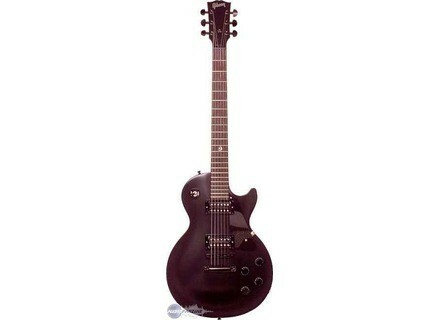 Bottom Line: the Gibson Gothic Les Paul is a Hard Rock Metal Beast.